I was anxious to leave the city and travel through the countryside. The main highway from Havana to Cienfueges was eight lanes wide. Traffic was sparse. The road was smooth. The scenery was lovely -trees, rolling hills and mountains in the distance. The agricultual land appeared abandoned. There were no small crop farmers and I later learned that a large percentage of the productive land is not in use. There were small villages where many of the population were standing around. Unemployment is high. There were large fields of sugar cane. The state owns all the land. The farmers lease the land from the state. Individuals can now own property in Cuba but the land is leased from the state. The Canadians are reported to be developing a resort condominium complex on beach property. Foreigners will be able to purchase the condos. 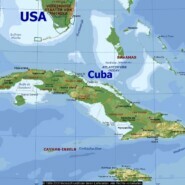 When Cuba opens up, there will be a huge land grab.